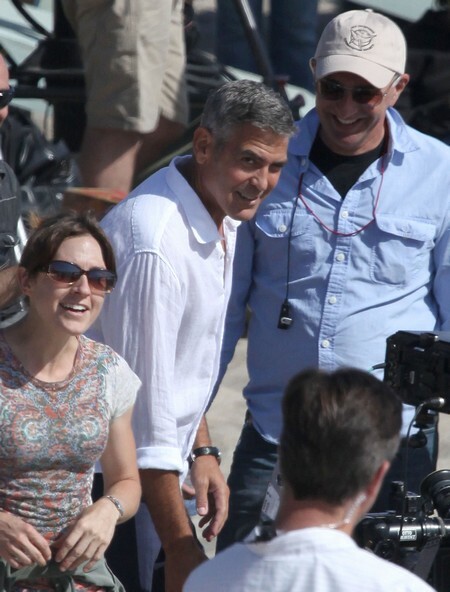 George Clooney And Brad Pitt Reunite With Jennifer Aniston? While the famous friendly buds – Brad Pitt and George Clooney – reunited together in Berkshire England late last night, is it true that Brad’s ex-wife Jennifer Aniston joined them? Don’t hold your breaths, tis’ not the case. However, the two came closer than you think – through George that is. George was most recently vacationing with his lucky lady, the gorgeous Stacy Keibler at his house in Lake Como – and whom else did the couple rendezvous with? None other then Jen and her main man Justin Theroux, who was in Italy on vacation as well. Who would have thought that Jen and George were friends, considering the history between her and Brad, who happens to be George’s best friend? But hang out they did, with Jen and Justin even hopping on George’s private plane in Switzerland last week. Now just what would Angelina Jolie think! Brad meanwhile has been laying low in the UK while his fiancé is filming Maleficent. George, however has been quite busy socializing with his old pal Brad last night. So did the two talk about George’s time spent with Jen? Brad, being the gentleman that he is, probably let it go – also probably because he didn’t want to experience the wrath of Angie, let’s be honest. So how does Stacy feel about Jen? It doesn’t appear as though her and Angelina are that tight, but then again who is Angie tight with. So my next question is – will we see George as Brad’s best man at his wedding? Even better – will George be invited to Jen’s wedding when she decides to walk down the aisle! Oh how I love the hot goss!